Looking for an inexpensive one-step solution for your speedometer/gps/data acquisition needs? Look no further. The Garmin Forerunner 201 is about the best thing imaginable for keeping track of your sorties (and we have big imaginations). The 201 is versatile, extremely rugged, reliable, and best of all very inexpensive. We use two units to keep track of speed, maximum speed, average speed, time, elevation and elapsed time at a glance. With the touch of a button (easy even with gloves) one may easily double the number of views on each unit. 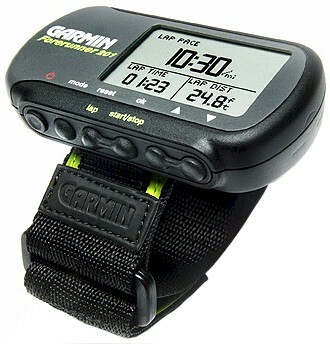 The Forerunner 201 is a wrist strap gps personal training device that has been around since about 2004. It comes with a data/power dock, a serial port cable for data downloads to your PC (uploading capability is largely limited to software updates), an expander for the wrist strap and a wall wart style charger for the rechargeable battery. Battery life is 12 - 14 hours on a full charge (the batterys in both of our units still perform flawlessly after three years). It also comes with Garmin software that we recommend you bin in favor of SportTracks (PC based) or MotionBased (Web based) analysis tools. The Forerunner 201 may be set to record in either "runner" or "cyclist" modes and you have your choice of english or metric units of measurement. Set the 201 to "cyclist" mode, set the averaging and threshold values to your satisfaction, dial up the data you'd like displayed (two easy to access screens) and you are on your way. The display is large and easy to read even in bright daylight and with moderate vibration. It is backlit for night use. A number of performance thresholds may be accompanied by a loud audible alert. We have experienced zero glitches with our Forerunner 201's in three seasons of serious abuse including crashes, dunkings, vibration, exposure to snow and freezing cold, extreme heat and dirt. About our only complaint is that the user does not have the ability to change the preset rate at which the 201 acquires way points. This leads to the memory filling up (under most conditions) somewhere after 150 miles or so of riding. Everything else still works, but the route downloaded at the end of the day will only contain way points and data for the last 150 - 170 miles. For most this will not prove to be any sort of an issue. When used in conjunction with a regular GPS unit for route finding it is not an issue anyway. We recommend the Garmin Forerunner 201 over every handlebar mounted, gear/wheel driven speedometer/odometer we've seen for dirt bikes. The GPS data acquisition is far superior to most motorcycle wheel/gear driven systems even on high end street bikes - and you can download your ride when you get home. For racing and/or training the 201 is the cat's meow. 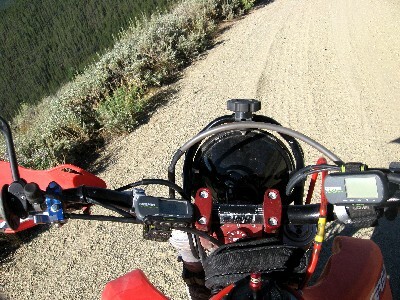 Optional accessories: handlebar mount (we like just wrapping the wrist straps around our handlebars better).